Chris Oliveros is best known for founding Drawn & Quarterly and acting as its publisher for 25 years. 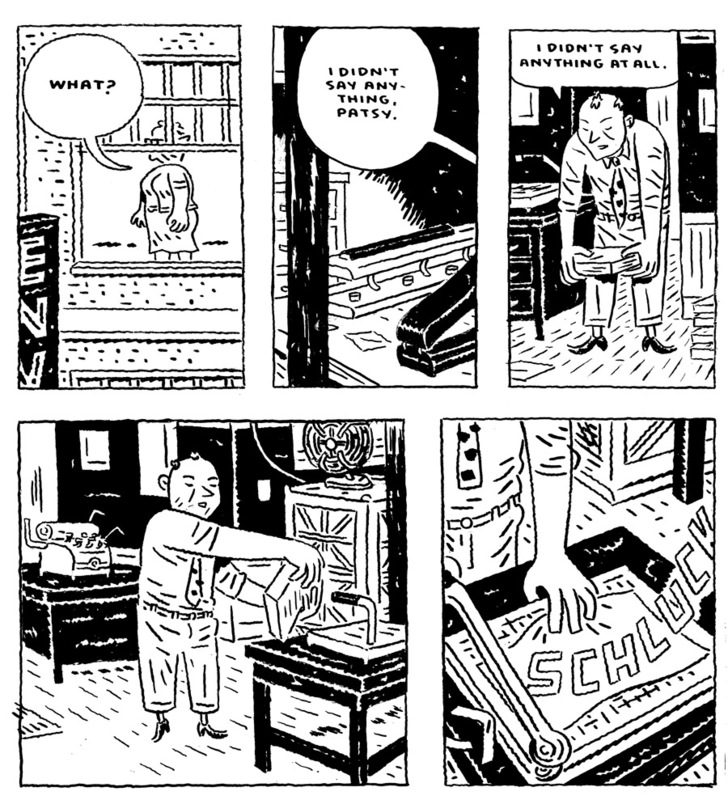 In April of 2015, Oliveros stepped down as publisher, and in January 2016, his self-published comic The Envelope Manufacturer was released with distribution from D&Q. 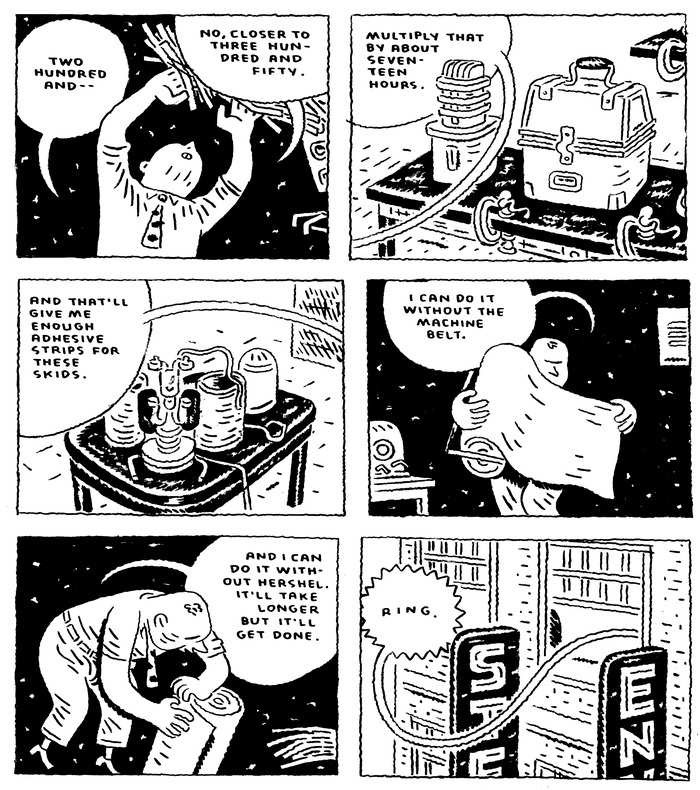 The Envelope Manufacturer is 102 pages of black and white comics about the anxieties and self-delusion of a small businessperson, his wife, and his two employees in a mid-century North American city. Oliveros’ characters believe that they can revive a dying business. The company is insolvent, with overdue wages, past-due bills for supplies, and an overdrawn bank account. Any attempt to improve the efficiency of the work or to boost sales is burdened by previous failure. The whole thing is a farce. And that farce is met with a magnificent self-delusion, a survival mechanism to get through the day. 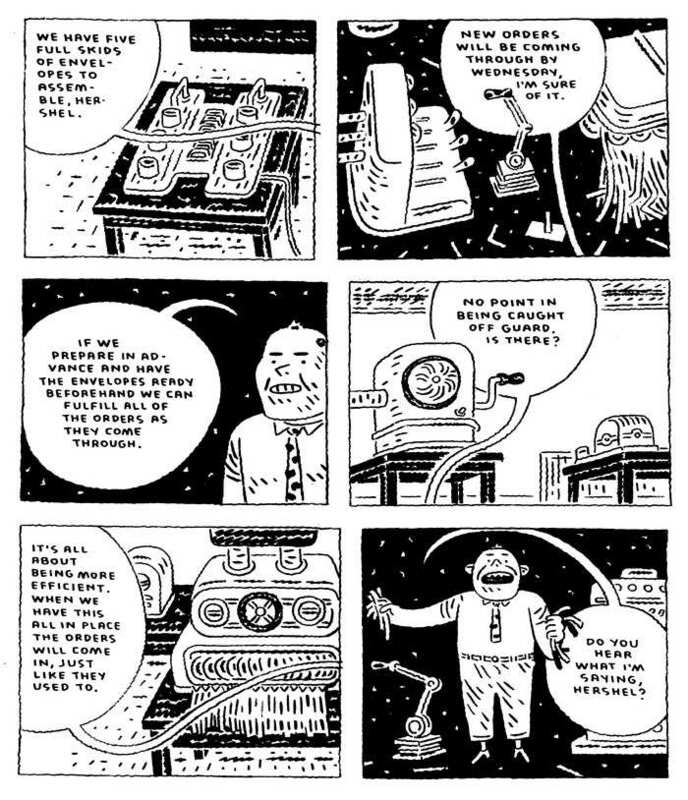 The cartooning is denseand disorienting – Oliveros constructs panels so that his buildings are cropped out of the image in various ways, or so that bodies in space lose their relevancy. Signage isn’t easily visible, characters float aimlessly. The effect is claustrophobic. 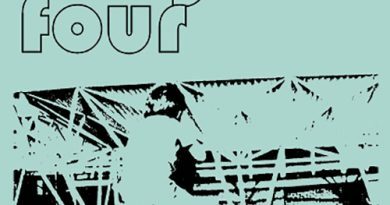 Oliveros’ mark-making is lovely and the setting is clearly one he enjoys – the bus and car designs in particularly are lovingly rendered, firmly placing the setting in the late 1950 to early 1960s. Odd machinery is illustrated on panel after panel, but it’s not clear if the bulky tubes, slicers, and presses actually do anything. Despite the insistence by Oliveros that the book is about an envelope manufacturer, the only thing seen in production in the factory floor is tiny strips of paper. The lack of envelopes is clearly a signifier for the impotency of the characters in play, but it isn’t half as clever as it seems. There’s a nostalgia for a time period here, and an anachronistic mechanical futility that don’t quite blend. 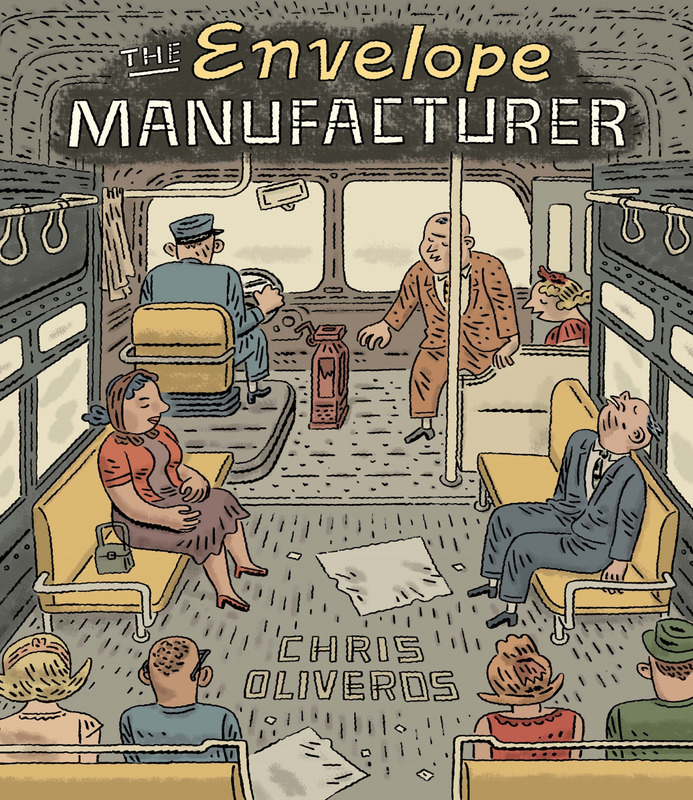 In some ways, the scenes in The Envelope Manufacturer are cyclical; Oliveros’ main character makes promises to himself and others, attempts to buckle down, or find efficiency in the work process, but ultimately fails and falls deeper into the hole of the business. Only his wife is able to find a way forward. The effect of the self-delusion, the claustrophobic cropping, and a lack of a true sense of forward motion all act as an uncoupling from reality, and the delusions of the main character and his employee Herschel are hard to separate from reality. In one protracted scene, we see the main character jump out of a window and fall for pages and pages; is this a suicide, or just a meandering mind searching for a way out? What’s missing is the reader’s ability to identify or root for the protagonist, despite how foolish or hopeless his goals may seem. Without the needed characterization in place, Oliveros’ main character’s maybe-suicide is a dispassionate, boring affair. Part of me wonders if this book is about Oliveros’ own experience running a publishing house, but I’m doubtful. The metaphor is bad (D&Q, by all accounts, is a successful business with a strong team and publication history). And even if the metaphor wasn’t bad, it’s a bit too on the nose. 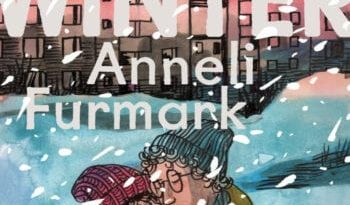 If the narrative or characters were a bit stronger, the disorientation and cloudy storytelling of The Envelope Manufacturer could be a great asset. But as it stands, The Envelope Manufacturer flounders, a product of its hurried attempt to get on the road to nowhere fast.